Curried Tempeh Recipe with coconut milk or Tempe Gurih in Indonesian, it’s really yummy. It's one of the healthiest Indonesian Recipe. 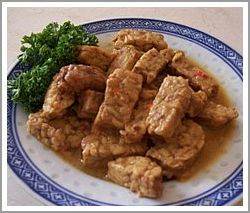 Tempeh is one of the best ingredients to make high protein recipes, because it is very healthy and delicious, although for people who don’t get used to eat tempeh, it has a strange taste. But for many Asian people this is one of the daily bases of the cooking. Curried tempeh recipe might be not the low calorie vegetarian recipe you’re looking for but it’s very healthy recipe because we use coconut milk in the dish. Tempeh is also one of the best replacements for meat. And if you are vegetarian and care about your weight, this recipe might be the good choice for you. Due to coconut milk your stomach would be very please for a while. They won't ask for more food so you wouldn't desire any food after you eat something with any coconut products. The high fiber in coconut takes care of all that feeling. It's truly amazing what coconut can do for your body health. Looking for more vegetarian recipes which are healthy and low fat? Try this Chinese vegetarian cooking. They offer you so much delicious, healthy and low calorie vegetarian recipe and easy to make with step by step guide so you can easily obtain the proper cooking techniques which are result in great meals. Make a spice paste of onion, garlic, terasi, turmeric and red chilies. Heat some vegetable oil in the pan and fry the spice paste until fragrant. Add ginger and galangal, fry it until fragrant. Add the thin coconut milk and let it boil. Add green chilies, fried tempeh, and let it boil on middle heat. Add sugar and salt to your taste. Add the thick coconut milk and let it simmer for a while on low heat until the oily comes out.